This insta-fit system is specifically designed to conform to upper brace brackets for instant comfort and prevention from lacerations. Made with 100% medical-grade silicone, this mouthguard is adaptable to changes in mouth structure as teeth adjust. The Braces Mouthguard outperforms conventional ones through the genius combination of shock absorption and fit all rolled into one. Adult: Ages 11 and older. 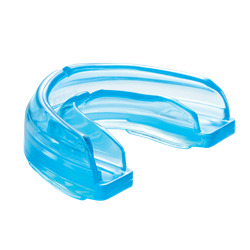 This product also meets NFHS wrestling requirements if an athlete has only upper braces.